King Arthur: Fact or Fantasy? Everyone has heard of King Arthur and his Knights of the Round Table but, whilst there may well once have been a famous ruler named Arthur, no one can prove that he or his court ever really existed. Although the time in which King Arthur is supposed to have lived – in the fifth and sixth centuries – was a dark age in Britain, the story of his deeds and the valour of his knights blazed right through Europe. Various parts of Britain, from Scotland to Wales and Cornwall, claimed him as their own, while the French insisted that he was from their own Celtic hinterland of Brittany. Sicily is one of scores of places in which Arthur’s tomb is said to lie. Despite this international element one thing that appears certain is that Arthur was a Briton. While other countries may have the odd Arthurian battlefield, grave or castle, in western Britain there is hardly a range of rugged hills or stretch of rock-strewn moorland that does not claim some association with King Arthur. Fascination with the story of Arthur began in the fifteenth century when Sir Thomas Malory pieced together folklore, old stories and writings in French and Latin in order to create his great classic Le Morte d’Arthur. Malory’s story is a superb romance, a chronicle of bloodthirsty violence, magic and chivalry. But is there any truth to it? The printer William Caxton, in his preface to the original edition of 1485, referred to opinions that there was ‘no such Arthur, and that all such books as be made of him be but feigned and fables’. Caxton gave such views short shrift by pointing out that Arthur’s sepulchre could be seen in the monastery at Glastonbury and that his Round Table was at Winchester. It is true that a 12th century writer reported seeing Arthur’s tomb opened at Glastonbury and witnessing that it contained his bones and the magical sword Excalibur. Apparently, the thigh bones and skull were of ‘gigantic size’, and the skull showed ten wounds. But the source and authenticity of this and other reports were seriously doubted by the seventeenth century, when the poet John Milton, among others, poured scorn on the story. Today there is no sign of an ‘authentic’ Arthurian tomb at Glastonbury or anywhere else and the ‘Round Table’ at Winchester is an elaborate 13th century fake. The real Arthur, if he existed, probably lived in the 5th or 6th century, shortly after the Roman legions left Britain. The Scots and Picts, taking advantage of the small numbers of trained soldiers among the remaining Britons and the softness of a population used to Roman protection, swept down from the north. The Britons appealed to another Barbarian tribe, the Saxons of Northern Europe, for aid and though they came, it was not merely to fight the Scots and Picts. They mounted a great invasion and swept all the inhabitants of Britain before them in a series of epic battles. At this dark moment in British history arose leaders who rallied the Britons under their numerous kings. One of them, according to an 11th century manuscript which contained documents of earlier date, was Arthur. In all the battles, which must have been some of the bloodiest in history, Arthur won overwhelming victories which made his legend grow. One record of the time tells that he bested 960 men in one day in hand to hand combat! Even allowing for possible exaggeration, it is clear that Arthur must have been not only a brilliant general but also a tremendous fighter in his own right. In view of Arthur’s semi-mythical status even within his own lifetime, it is unsurprising that when he fell at a place named Camlan in the year 539, the people could not believe he was dead; he was merely sleeping, they thought. In Snowdonia in Wales he is said to be in some secret cave. Shepherds have said that they have seen him playing chess with his ghostly warriors in inaccessible hollows of the mountains. But other locations are also claimed to be King Arthur’s final resting place, including the aforementioned Glastonbury. Ancient manuscripts tell us that the monastery there was once surrounded by marshes and called the island of Avalon, which is the place where Arthur was reputed to have been taken to recover from his wounds after his last battle. 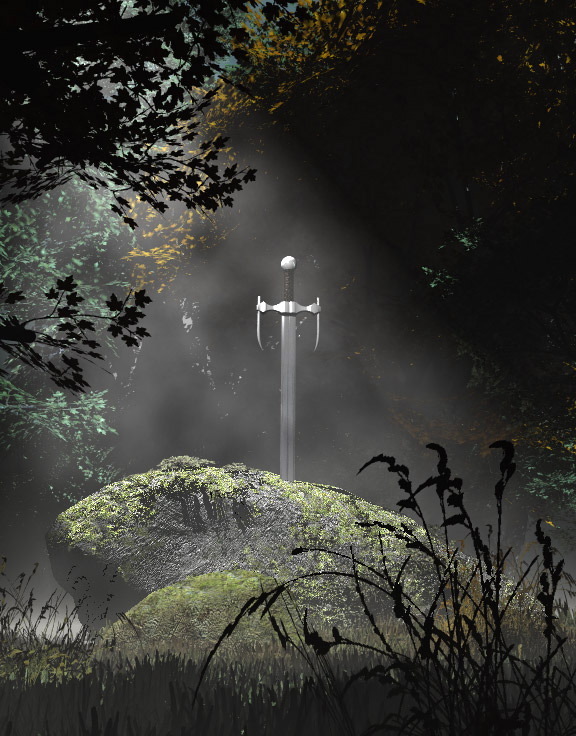 As for Arthur’s sword Excalibur, which was supposed to have been thrown by Sir Bedivere the one-armed into a lake, this may have ended up in Dozmary Pool on Bodmin Moor in Cornwall. Where Arthur is concerned, no one today can separate fact from fantasy entirely. But there appears to be little doubt that Arthur lived, fought and died for Britain’s lost cause against the Saxons and that he was the country’s first great national hero. As a proud Brit I’m sayin’ he’s real 🙂 We’ve been to Tintagel many a time, a lot of Arthur pride in evidence, lol. Never heard of the possibility that he might have been buried as far south (and east) as Sicily. Seems a bit far-fetched. One is left to assume that the Roman legions had been long gone at the supposed time of King Arthur’s death. Have we ever heard about any of his Knights and their demise? Thanks! There seems to be a lot less information about the fate of Arthur’s Knights, many of whom in fact had no relationship to him at all but were simply incorporated into his myth. As an interesting aside, Sir Gawain also has Italian connections – he appears in the architecture of the north portal in the cathedral of Modena, constructed in 1184! I actually read Le Morte D’Arthur, or the first half of it (my library system has a copy, which has been separated into 2 parts, Vol. 1 and Vol. 2) before I began writing my story about Morgan Le Fay. I also had to read Sir Gawain and the Green Knight for school- interesting enough, so it’s surprising to me that you wrote of this. If I remember the notes from my school assignment properly, Sir Gawain and the Green Knight was one of the first stories written in English. I don’t fully remember, but I believe that it’s a contemporary of Le Morte D’Arthur. Personally, I would like to say that there was a King Arthur, and a court of Camelot, and that it was a time of chivalry and fair ladies, but I don’t know. I suspect the stories had been greatly exaggerated over the centuries before being transcribed. I believe that there was a king, and a kingdom that Camelot was based off of, but it was not half so grand as we would like to think. On another note- since I am an American, and have never been overseas, I have had to rely on the ancient myths- which I have twisted to suit my purposes. Please forgive me for any liberties I have taken. I’ve always had an interested in King Arthur. I suppose it is because of the fantasy-like world they lived in . . . or supposedly lived in. Thanks for the further information on Arthur. The stories around him are rich and satisfying and it’s great to hear more historical detail. Legends always appear to have some fact within them. Long ago people di not just make up stories just for the sake of it. I was always told and learned, “Whenever England falls, Arthur will return to re-unite the country and it’s people” There are many things that we still have to learn, things that seem far-fetched, magic, dragons, wizards.